The world’s smallest patch clamp setup. Providing biggest results. 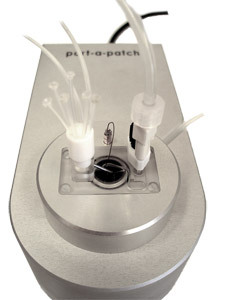 The Port-a-Patch is a one-cell-at-a-time system, which is surprisingly small for a complete patch clamp rig. Patch clamp recordings in the whole cell configuration, and single channel recordings in the cell attached configuration, can be performed with planar patch clamp chips. 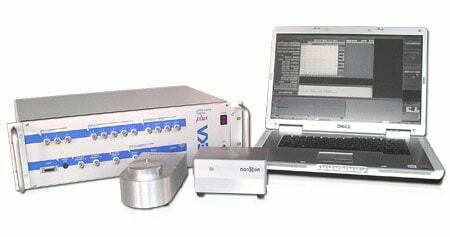 The Port-a-Patch is routinely provided with an Axon/MDC MultiClamp amplifier or an EPC-10 amplifier from HEKA together with a computer and the software packages. 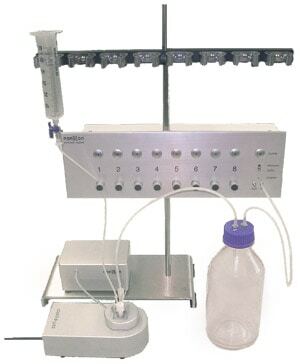 Manual liquid-handling is combined with computer controlled suction supply for automated sealing and whole cell access. An optional Perfusion System and Temperature Control device is available. A unique feature of Nanion’s automated patch clamp platforms is the possibility to exchange intracellular components. With conventional patch clamp this is difficult because of the tiny dimensions of the pipette tip, the long tapered shaft and, thus, the diffusion limitation of the liquid exchange. With Nanion’s systems ion channels regulated by second messengers acting on internal binding sites can be modulated simultaneously by compound additions to the external side of the membrane. This allows for novel and complex experiments on interactions between ion channels and drugs. Another aspect of internal perfusion is the possibility to add membrane permeable drugs directly to the inside of the cell and, thereby, accelerating the time course of the experiment. 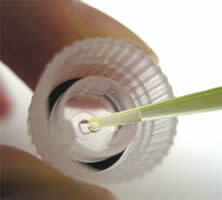 Using the Port-a-Patch, the internal solution can be exchanged using a pipette. As an example, pore forming compounds like Nystatin can be used to perforate the membrane patch in order to obtain electrical control over the membrane. Thus the cell´s interior remains intact and the cytosolic constituents that can be important for ion channel function are preserved. Kv1.3 has been described as to show a shift of its voltage dependence to more positive potentials when recorded in the perforated whole cell configuration. In our recordings performed with the Port-a-Patch we could confirm this observation. The voltage-dependence was shifted significantly to more negative potentials in the whole cell configuration compared to the perforated whole cell configuration. Whole cell currents after a conventional membrane breakthrough (left) and perforated whole cell currents (middle). Nystatin was added to the internal solution after the cell attached configuration was reached. I-V curves of peak current of 3 (conventional) and 5 (perforated) cells (right). 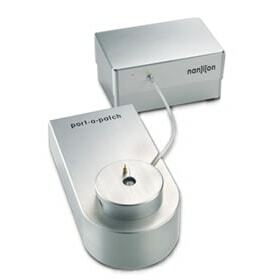 Perfusion Nanion´s Perfusion System provides a fast and continuous perfusion. 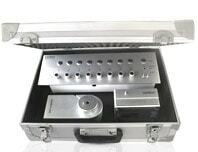 It allows accurate application of up to eight different compounds and solutions. The micro-controller based design makes it compatible with all commonly used patch clamp software solutions. Together with the dedicated perfusion chamber for the Port-a-Patch, it is a simple system for automated perfusion experiments. 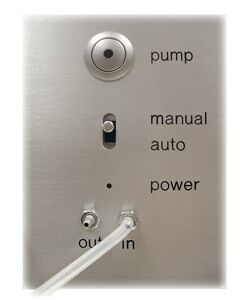 The system is fully software controlled, but can also be used in a manual mode. Furthermore, the system can be upgraded for temperature control. Currents of RBL cells endogeneously expressing K+ permeable channels (holding potential -100 mV). The external K+ concentration was changed using the Perfusion System. Exchange times for all solution exchanges were approx. 150 ms. Low K+ (4.5 mM K+), high K+ (143 mM K+). For the Port-a-Patch including a PTFE inert manifold. The pump for aspirating the waste solution and the valves can be either controlled manually, by the electrophysiology software or by a standalone program. The Perfusion System can be controlled by a variety of interfaces: Serial, analog or digital control connector. Direct connectors for the following interfaces are available: Digidata 1322 and higher, HEKA EPC-9/10, ITC 16-18. The Temperature Control is an add-on for the Port-a-Patch. Together with the dedicated perfusion chamber for the Port-a-Patch it is a simple system for automated perfusion experiments with temperature controlled solutions. The temperature controller has two output channels and is used to regulate a connected heating element. 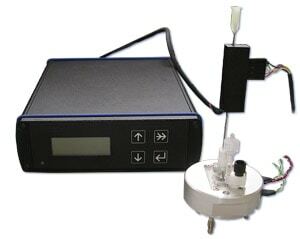 The system utilizes a perfusion cannula with heater and sensor. The set-point temperature is reached within 30 s to 5 minutes, depending on the system to be regulated and on the settings. A maximum temperature of 50 °C can be obtained. The accuracy is +/- 0.1 °C. The temperature controller heats actively, but the cooling is passive. Therefore, the minimum temperature is defined by the room temperature. A room temperature beyond 10 °C is not recommended. The outputs are isolated against ground, that is, the temperature controller does not interfere with your experimental setup. Discover the many features and applications of the Port-a-Patch! If using an EPC-10 PLUS you have the choice between a desktop PC (state-of-the-art Dell computer, 17“ TFT monitor) or an adequate notebook. Perfusion System and/or Perfusion Chamber.